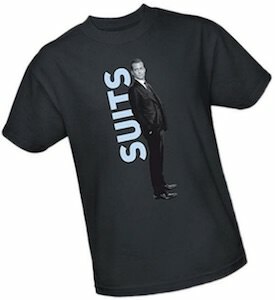 Now there is a Suits Harvey T-Shirt for all the fans of the TV series Suits. The Suits t-shirt is dark grey in color and unisex so that it will look great on men and women and it comes in sizes Small – 3XL and they are all made from 100% cotton. 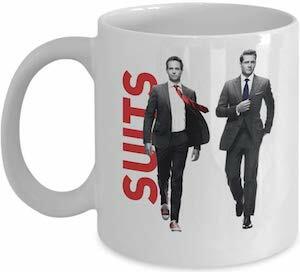 On the shirt you can see a nice picture of Harvey Specter and he is wearing a suit as expected. 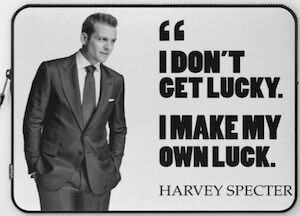 Behind the image of Harvey it says in bit letters “Suits” so that everyone know what show he belongs to and that he is wearing a suit. This is a great shirt for all the fans of the shows and it does make for a fun present too. Now there is a Harvey Specter Laptop Sleeve for all the Suits fan with a laptop. The suits laptop cover is available in a version for 13 and 15 inch laptops. On the laptop sleeve you can find a black and white picture of Harvey and next to him one of those things he would say “I Don’t get lucky I make my own luck” and so far he seems pretty lucky most of the time. The Suits laptop sleeve has a microfiber lining to protect your laptop from scratches. Now your work or school laptop can be protected from harm in a cool Suits style.